Why choose Regal Motors for Service? As your Rosetown Ford dealer, we have the right stuff when it comes to your vehicle. 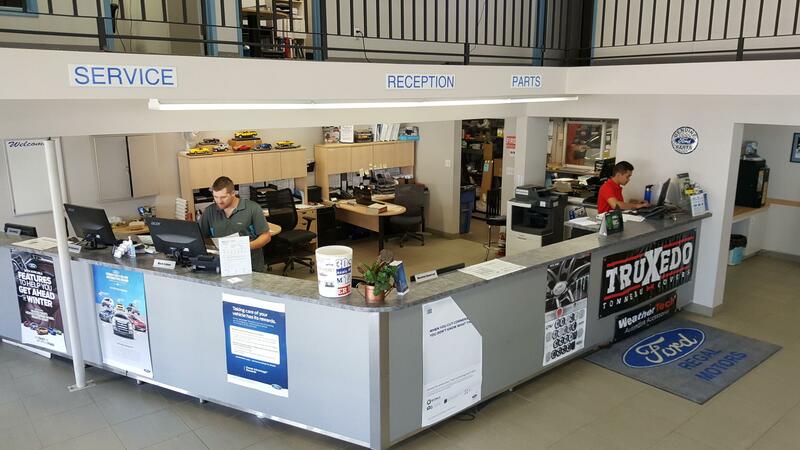 Our service department is full of friendly faces that truly want the best for you and your vehicle. Our staff is available 6 days a week to accommodate your schedule; we value your time and want to get you back on the road as quickly as possible. Even though we're Ford-trained, we can happily assist with repairs and maintenance on all makes and models. As a Regal Motors Ford Service customer, you can expect a positive experience. We know that bringing your car in for service can be a pain, but when you bring it to Regal, we strive for complete customer satisfaction; it's our #1 policy to achieve complete satisfaction for each customer every time. When your car needs to visit our repair shop, you can be assured that our staff are Ford, Lincoln, and Mercury experts. Our technicians are factory-trained and ensure all repairs are performed according to factory standards. We do it promptly and we do it right. We use genuine Ford and Motorcraft parts because they are made specifically for your Ford, Lincoln, and Mercury vehicle. We offer competitive prices on everything your vehicle needs﻿, from maintenance to repairs, to parts and accessories. We're here to help! If you have a question about something leaking, creaking, or squeaking, we can happily get your vehicle running smoothly again, or give you advice on what we recommend. We are a full Ford franchise offering warranty on all Ford vehicles in North America If you have any questions about our services, we welcome your inquiries via email or call our Service Department at 855-920-4343. Contact us today! Oil changes are an essential part of vehicle maintenance. It keeps your vehicle running at peak efficiency and maximizes performance. When you use the right oil, your vehicle's engine is cleaner, it reduces overall wear, and improves fuel economy by up to 2%. An oil change service from Regal Motors provides drivers with peace of mind knowing their vehicle is operating at its best. Our trained technicians are experts in providing a high level of care and efficiency when completing an oil change. We get it done right the first time. In addition, our oil change services are not limited to just oil and a filter. We provide a tire rotation, brake inspection, multi-point inspection, fluid top-off, and battery test with every oil change. If your vehicle is equipped with an Intelligent Oil-Life Monitor (IOLM), it will determine when you need an oil change based on your driving habits, environment, and vehicle type. Most drivers can expect an oil change notification between 12,000 km and 16,000 km under normal driving conditions. If your vehicle is not equipped with IOLM, please refer to your owner's manual or give us a call. We're happy to help!